Grown as much for foliage as flower. Cut back after flowering. Division needed only after 4 to 5 years (when centers begin to die out). Avoid overwatering. Especially loved by small children. Lamb's ear is often seen in old fashioned gardens and is again gaining popularity because of its hardiness, ease of care, and effective contrast provided by the color and texture of the leaves. 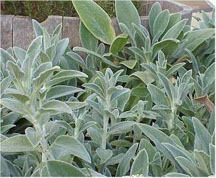 Its greatest virtue lies in the soft, furry, silver gray foliage that reaches 10 to 12 inches. In midsummer the plant sends up flower spikes which are 24 to 30 inches tall with sparse lavender colored flowers. It is best grown on a lean soil with full sun. It is drought tolerant and is an excellent choice for dry walls, sunny banks, and wildflower gardens. In rich conditions the plant can become quite lanky. Even in these situations it can be very effective with aggressive pruning. I mow them back to ground level and dig out excess roots right after flowering. I give them a good shearing again in the spring to remove old foliage from the previous fall. As aggressive as they are, I would not be without them because of the wonderful contrast and texture they provide. Division is needed every 2 to 3 years if a good thinning/ pruning regime is not practiced.